The Resort 300 is by far our most popular model. About 75% of our customers choose the 300-gallon Softub. Why? More often it’s a happy couple seeking the maximum relaxation possible for those quiet evenings alone. Others choose the the Resort 300 because of the bench seat that raises the seating height for one person. It has a built-in LED color-changing light. The Resort 300 has 7 jets total: (5) therapeutic jets and (2) hydrotherapy/pulsating jets above the seat. The larger size is the perfect choice for a family, or if you want a spacious feeling while you enjoy unwinding in your spa. People over six feet tall especially appreciate finally having a spa where you can be up to your shoulders in hot water. (Many acrylic spas seats are actually shallow, compared to the Resort 300). The less tall person has the same comfort and depth using the hydro-therapy seat. The extra 3″ deeper and 6″ wider makes an amazing difference in additional room, compared to the Softub Legend 220. The extra 80 gallons in the Resort 300 allows for four adults to fit very comfortably in the spa with room for two more. Although the statistics accumulated by the Hot Tub Council show that 98% of the time there are usually only two people using the spa at any given time, you will certainly appreciate the extra space when you want it. People find that the Softub Resort 300 has a low electrical cost-of-operation ranging from $12.00 to $18.00 per month (with a temperature set at 104 degrees). We have personally installed thousands of Softubs, and we have rarely had to tell a customer they have to go with a smaller spa. The height and width of the Softub Resort 300 rolls through a gate or a narrow walkway – even through a standard 30″ door or slider. There is no other 4-5 person spa that will go as many places as a Softub. Even with a crane, most acrylic/plastic spas just won’t fit where a Softub will without a crane. The light weight of the Softub is safer to move and install. We find the Resort 300 to be absolutely magical. The swirling, bubbling hot-water therapy offers the perfect stress relief after a long hard day of work and feels heavenly. You’ll never regret choosing the Resort 300. 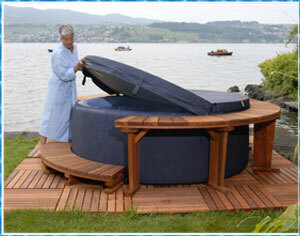 Softub Manufactures Suggested Retail Price $5,395.00. You’ll save even more if you live in the 805 area. Call us today for our “Huge Incentives” 805-654-9000.